The Nifty Futures and Bank Nifty Futures continued to move up last week, gaining 2.2% and 1.0% respectively on close. And Bank Nifty is relatively under-performing in the recent uptrend. However this may so far foreign investors are relentlessly selling in equity market and Debt Market and had pulled out more than Rs 14,000 crore. The Outflow of Debt Market is far steeper than Equity Market. Nifty hourly charts turned to positional buy mode when it breaks the resistance level 8350 and continue to move upwards from there. Currently the support zone in Nifty Futures comes around 8272 on the hourly charts. Nifty and Bank Nifty futures tested 5EMA High last week but still failed to close above 5EMA High. 5EMA high levels comes around 8485 and 18635. Any weekly close above 5EMA high levels are likely to change the major trend towards longterm uptrend. India VIX has been cooled down from the peak 21.88 down to sub 17 levels. 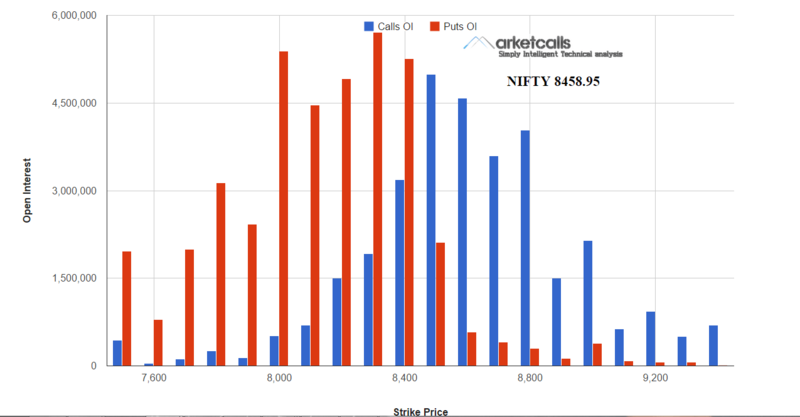 Which suggests downside in the market is limited till the expiry and also the strong put writing near 8300PE suggests the possible expiry above 8300. Earlier put writers are bullish on expiry above 8100 now the levels has been shifted to 8300 and quite extra bullish on expiry. RRG Study shows CNX Metal, CNX Enery and Bank Nifty are likely underperform relative to CNX Nifty in the upcoming sessions. CNX Finance, CNX Pharma, CNX PSU are entering into the leading zone this week and likely to outperform CNX Nifty. CNX Auto continued to outperform but still the momentum is dropping and the outperformance is likely to fade after couple of sessions. Hello Rajandran : though I would visit your website once a while as I was not a TA guy.. I have recently started studying TA and use yr charts more often. I realized you are really offering a great service to your trader brothers … God Bless you… Wish you the very very best ….